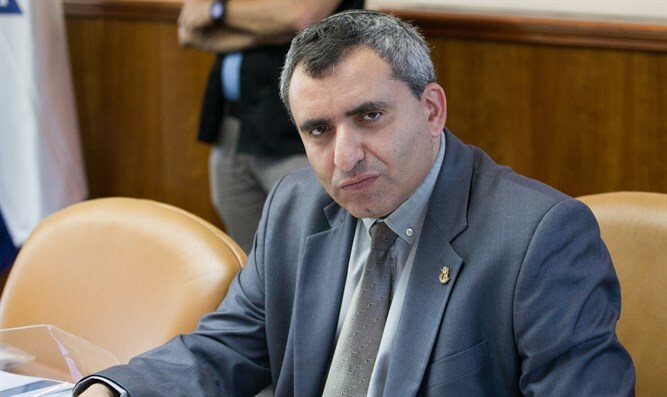 Minister of the Environment and Jerusalem Heritage Ze'ev Elkin (Likud) said Thursday morning in an interview with Arutz Sheva that supporters of Amona in the government need to be candid about their failure. "It hurts me that we as a government failed to save Amona - that was the goal." "Although I am not the Minister of Justice or Defense and so could not handle it personally," says Elkin, "I too am responsible and must be honest and say we failed. We failed because there was no majority in the Knesset to pass the bill with a retroactive clause [for a pre-existing court decision, as in Amona's case] because not all our partners had agreed to allow that clause, and I'm referring to the Kulanu party, but still, we as government ministers are responsible for this and instead of giving explanations we have to say we failed in this instance." Minister Elkin was not surprised by the court's decision to reject the absentee owner plan that was drafted to move Amona to a location on the same hill. "We knew there was a big risk here. It doesn't have much precedent, so I was not totally surprised. The right solution was the retroactive clause for which unfortunately we were unable to achieve a majority because of the Kulanu party." He said the real struggle over the regulation law must focus on the relationship between the Knesset and the Supreme Court, "I fought years for this and since we established this government the Likud required all partners to enact the law to overpower the High Court [in the case of their cancelling legislation passed by the Knesset]. We convinced our partners except Kulanu, so there is currently no majority to pass it. We'll have to work hard in the next election to get a majority for passing this law." Minister Elkin is convinced the regulation law will be enacted. "I suggest that the Defense Minister and all those who say that the High Court will eliminate this should wait. The people elected us to legislate and do what we believe in; true, the Attorney General said he will not defend it but the Knesset legal adviser Eyal Yinon said he would defend the law. If the law is cancelled, well, we took that into account as well and there are several decisions of the Attorney General that provide solutions for the vast majority of homes in Judea and Samaria even without a regulation law." Minister Elkin also has a message for the residents of Amona: "This morning we must tell the residents of Amona that without their determination the law would not have gotten to where it is. I never lied and have been telling them for the last few years there is a chance that we won't succeed in saving the village. But they beat my pessimism and thanks to their determination next week the regulation law shall pass." Minister Elkin estimates that the coalition will survive. "I do not think any of our partners have an interest to dismantle the government. Even if the government doesn't succeed in everything, it is still the best nationalist government that could be. If we go to elections there is a chance that the Left will win. Yair Lapid pushes for the pre '67 boundaries and is perceived today as the candidate of the Left, so with elections everyone knows how it begins but no-one knows how it ends, and probably in the Trump Era nobody wants to overthrow a government of the Right. There are those trying to overthrow the government as is the case with the media with reports of investigations, but we have seen that Herzog's investigation closed even though it was carried out under warning. So if there are attempts to overthrow the government - that simply requires the entire national camp to unite."